Addy is as adorable as her name! She loves to please and is doing well in the show ring. We love her here and know that she will produce many outstanding puppies to carry on the kennel. Addy carries for cream and is a black/tan who can produce black/tan and cream in a solid and dapple pattern. Mysty is a beautiful girl who can produce black/tan and cream in solid and dapple pattern. Bling is working toward her AKC championship and will not be bred anytime in the near future. This girl has work to do. Java is a wonderful puppy. She loves her daddy too! Greta is the smallest in weight here at Bright Creek weighing in at 9 lbs. 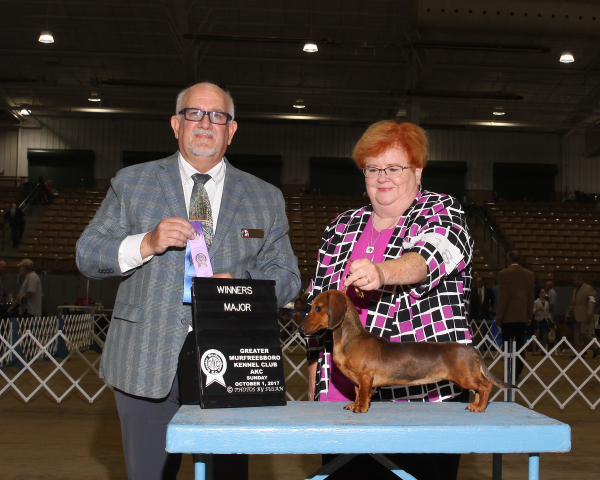 She sports a wonderful line of dachshunds that compliment our breeding program. This picture was taken during a shedding period. More and better shots to come! Ruby is a home grown daughter of JB and Lola (retired). She is a pistol of a dog with a great nose. Working toward her championship in 2019. A black/tan small girl carrying for cream through her mother's Stoneriver bloodline and carries for chocolate thru her father, our handsome Dudley. She is 6 months old in this picture. Every once in a while you will hit up on a female who has no hangups, gives awesome genetics and is an excellent mom and caretaker of pups. I should keep every female this girl produces and do myself a great favor! We love our little Lamby! Coco is an outstandingly bred girl who loves her babies. This picture doesn't do her justice. "Wrinkles" as we call her is long and low and one of our heavier mom's. She has an excellent temperment. Spayed and retiring. 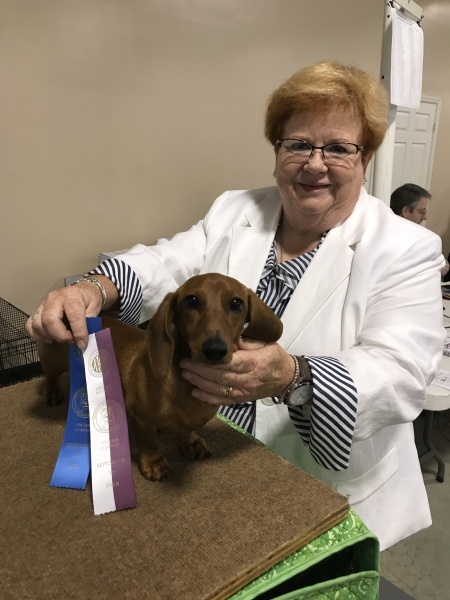 What a contribution she has made to my breeding program and all the lovely pups that are living the life of leisure throughout the southeast. Thank you little girl. Frost has been spayed and is looking for a furever home. ​Jolene is a live wire that will play until she drops. She loves her toys and her people. Shelly is an up and coming girl at Bright Creek. We hope you will continue to watch her progress.